All Saints, Scraptoft is a beautiful village church on the North East edge of Leicester. The oldest part of the building goes back to 1200AD and it has Grade 1 Listed status. The building was extensively re-ordered in 1991 and is now a wonderfully flexible space for worship, events and social occasions. We don’t have a church hall, so everything we do is based at the church and takes place here. Each Sunday there is a Sung Eucharist (communion service) at 10.00am, which lasts approximately one hour and we use a combination of traditional and modern music. On Wednesday evenings, at 7.30pm, there is a Said Eucharist, which provides worship of a quieter kind than Sunday. There is also a regular Taizé style service most months. Your ministry to the younger age-group is focused at Messy Church which currently meets once every two months on a Saturday morning. There is a monthly Coffee Morning, a Coffee Stop (at which people bring along their knitting or other crafts) or other event (Summer Fete, Harvest Weekend, etc.) In addition there are regular Bible Studies held at lunchtime. 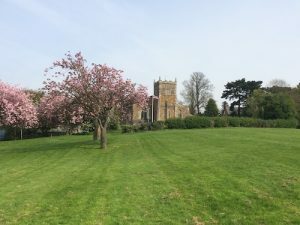 We are part of the Diocese of Leicester but come under the episcopal care of the Bishop of Richborough.